SOMETIMES early mornings can be warm and skies blue. 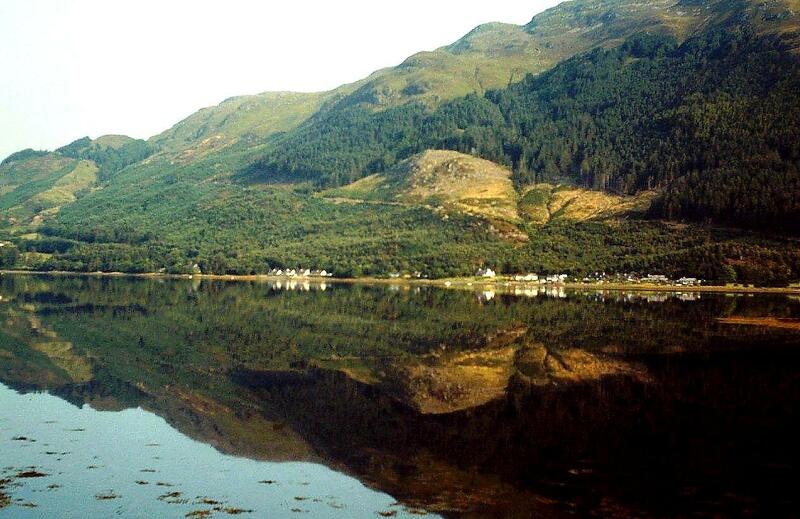 Sometimes the air is so peaceful that mountains reflect in lochs while shadows retreat to cooler places. This morning, in Strath Croe, nothing stirs except bees. Even sheep remain motionless. It’s a perfect day to traverse a high ridge . . . I leave the car at the head of Glen Shiel and climb along a stream called Allt à Coire into a high rocky basin known as Coire na Cadha. Up here is a silent world of empty sky, bright sun and hazy peaks. But Coire na Cadha does not come without its perils. The grassy ascent up its southern wall to the summit of Sgùrr an Fhuarail (987m or 3,238ft) is a hands-on-turf, sweaty, heartbreaking slog for its entirety. Every heavy step is a bitter-sweet grind through purgatory on a journey to heaven. Is it worth it? Stumbling onto the airy ridge just below the summit cairn, with sudden views of unknown mountains and deep blue valleys – it is worth every single grunt and gasp, every bead of sweat. And there are many. 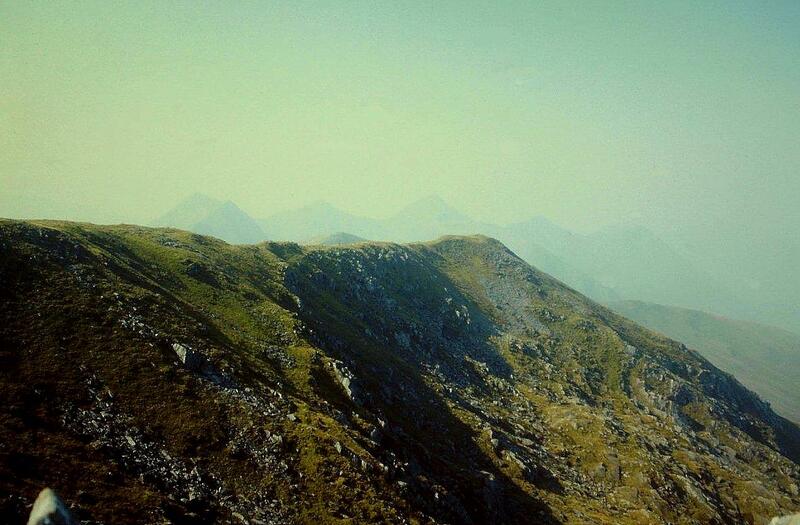 My ridge shoots off west to the nearby Munro of Aonach Meadhoin (1,001m or 3,284ft). 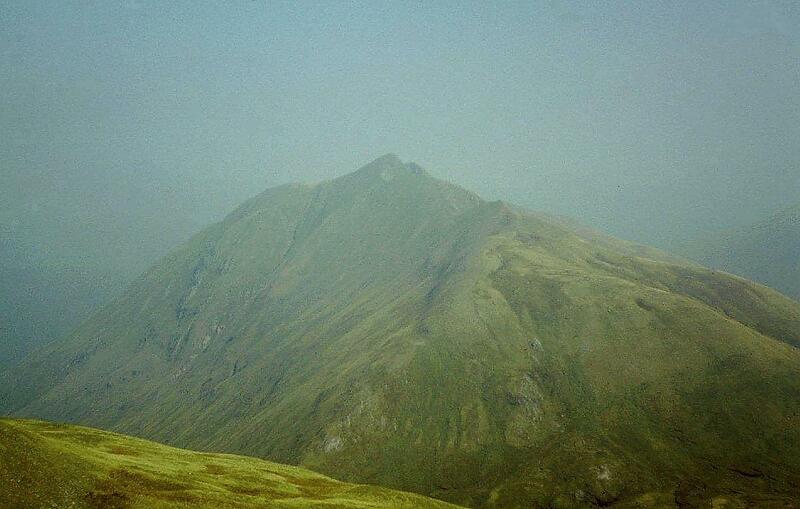 In the distant haze is Sgùrr a’ Bhealaich Dheirg (1,036m or 3,398ft), and, tucked out of sight behind it, Sàileag (956m or 3,136ft), my final peak. Few things in life are finer than a walk along a mountain ridge with the sun burning your back, a hot breeze in your hair and dark ridges on the horizon. Few things are more uplifting or more satisfying. Up here in Kintail, where the rocks of the earth reach up to scratch the sky, perceptions alter because the world is a different place. 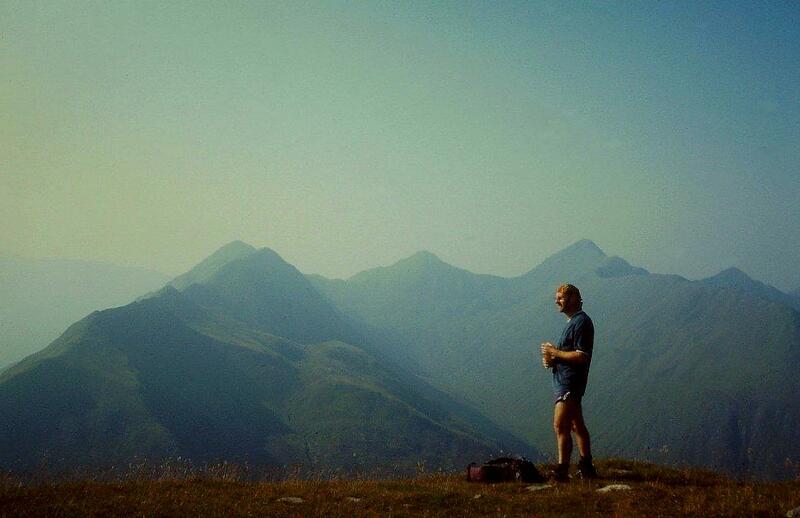 This entry was posted in Camping, Climbing, Environment, Hiking, Mountains, Walking, Weather and tagged Munros, outdoors, Scotland, The Munros. Bookmark the permalink. Funnily enough, I’ve just got my walk report for those 3 hills in draft. 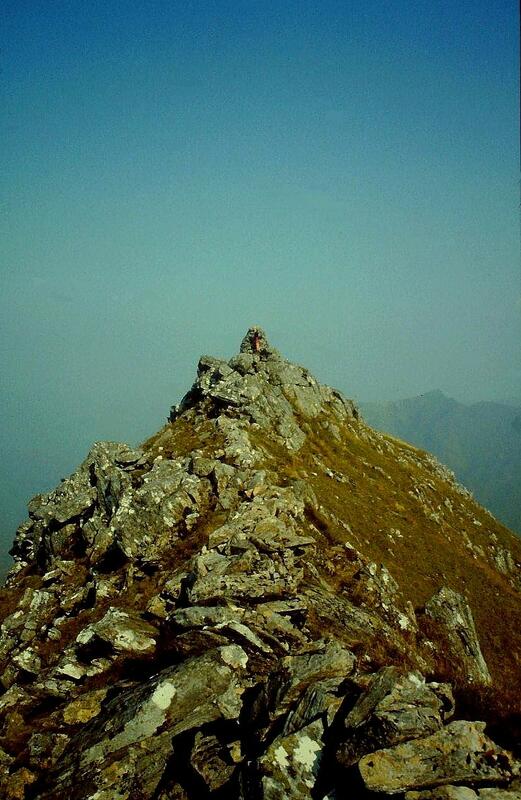 I still have the top of Sgurr an Fhuarail to do though – hopefully this August. Is it really that steep? Hi Carol. It’s very steep – but grassy steep. There will be other ways up, but I headed into the corrie, and from there you can look at the summit of Sgurr an Fhuarail and see a grassy patch just to the right that goes all the way up. It’s a right old slog but it takes you straight to the top. 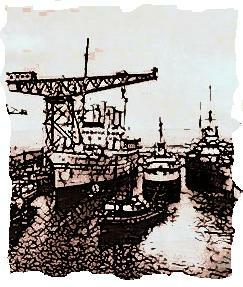 PS Beast Dhubh. I like that. 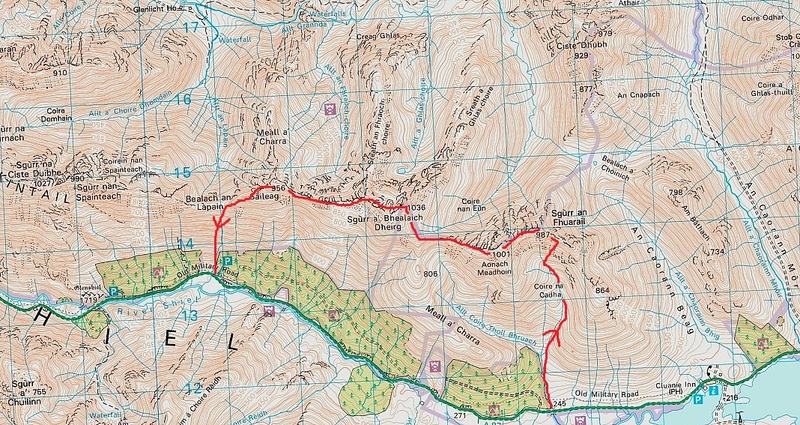 Ah no, I was going to go straight up the rounded (convex) slope opposite the Cluanie – I know how steep it is from the corrie as that’s how I got to the Munro summit – that was hands-on turf! I have always been fascinated by the Scottish Highlands. 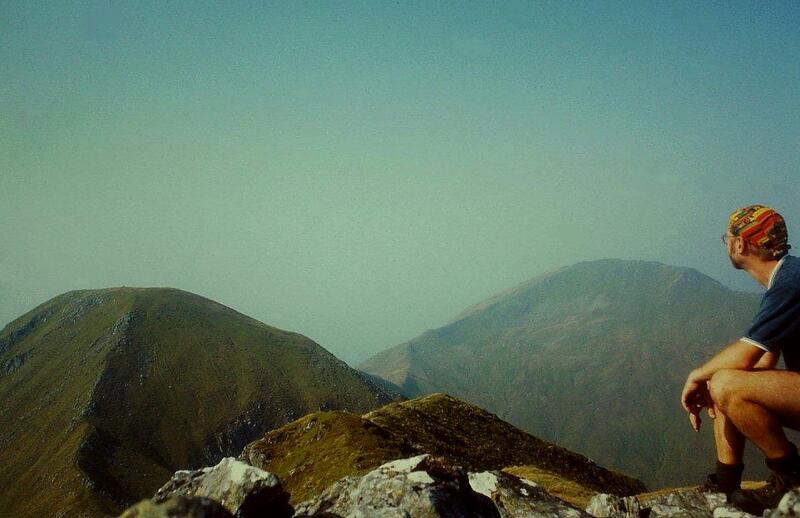 My brother was in training as a soldier with the SAS in the Scottish Highlands. I think he had ‘sold out’ at the time, for he cannot remember many details. Thank you for a beautiful post that makes my hiking boots jump. Hiya Hanna. You should get yourself up to the Highlands in your jumping boots when you’re on your way to Ireland. That’s what they call killing two birds with one stone. Two for the price of one. I might have a run up there soon. My enforced life of leisure is getting nearer by the day. Who knows, I might find a new job up there. A run in the car. As opposed to a chicken run, a run on the pound or Jack, Queen, King, Ace. You’re getting there, Hanna. Keep it up! All part of the service, David. Hope you had a good week. Hi there Loty. Thanks for that. Have a nice day. It looks like a blisteringly hot day from the photos. I can well imagine the grunt and groan of the climb on a day like that. And the exultation on reaching the top. Hi Chris. There were some choice words to go with the grunts and groans if I remember correctly. Great photos, Alen! A real mellow, vintage feel to them. How was the third shot taken? It would look like a forest of spears or pikes, if it wasn’t for that one head of grass! I can almost feel the heat in the last photo – it’s rare to have days like that on the tops and the sunburn can be excruciating! Hi Jo. Now you come to mention it, that third shot does look like a forest of spears. I used a time-honoured photographic technique. 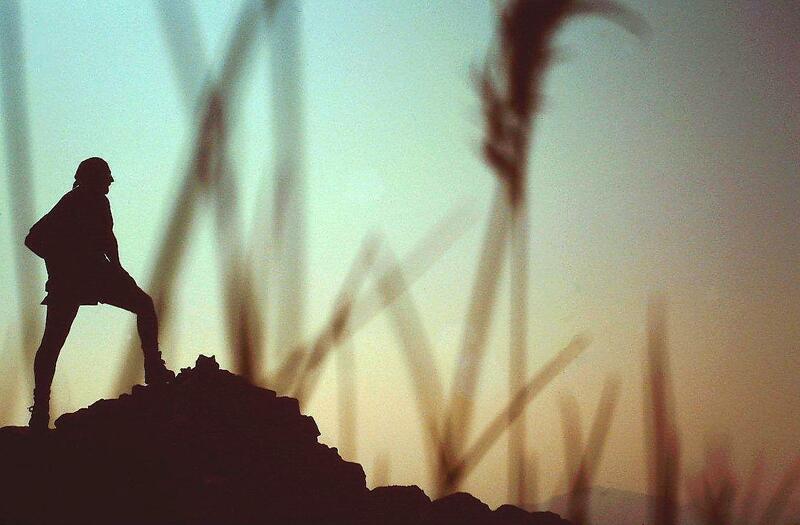 I set the timer, plonked the camera on a tussock, and ran to get on the photo. I’m sure I didn’t intend it to come out all arty farty like it has. Whenever I’ve tried to do that I’ve missed myself out of the picture completely! So I think you did pretty well! And here’s me thinking that you set the self-timer before scurrying nimbly up that tree in Windermere. No, no. My daughter Verity is a photographer! I did scramble quite nimbly, though!